Please sign the #HSLDAMustAct petition on Change.org! Homeschoolers Anonymous is made up of a diverse group of people. We don’t really have a “thing” that we all agree on other than this: we have seen or experienced harm within the conservative Christian homeschooling movement and we think those stories should be told. The truth should be known. The people involved with HA are not homeschooling’s worst nightmare. Rather we are its internal whistleblowers. We are all intimately aware of the problems in homeschooling because we were there. We’re former homeschool kids, former homeschool parents, and even current homeschool parents. We know how unpopular it is to say, “Hey, I have some problems with homeschooling,” but we care about raising awareness so people can address the issues, make things better, and begin to heal. The first step is recognizing that a problem exists. The Homeschool Legal Defense Assocation (HSLDA) made a decision yesterday. That decision was to respond via Facebook status (screenshot is here) to criticism from a former homeschooler who has been researching the impact and goals of HSLDA advocacy. This former homeschooler, Libby Anne (a blog partner of HA), came to the conclusion that HSLDA has not handled the issue of child abuse within homeschooling environments appropriately. Instead of responding to allegations of child abuse responsibly, HSLDA passed off these abusers as wrongly “persecuted” Christian homeschoolers. These allegations are serious. When talking about Michael Gravelle, a man charged with abusing his biological kids and then putting his adopted kids in cages, Scott Somerville — an HSLDA attorney — called him a “hero.” This fact was documented by the Akron Beacon Journal and the Journal article has been preserved. As if this was not enough, before this abuse case with the cages, Michael Gravelle had sexually molested his biological daughter, who ran away from home at age 16, which she personally disclosed in an interview. After the abuse case, Michael Gravelle punched and violently shook his wife. He was charged with domestic violence. Then a warrant was issued for his arrest because he failed to show up to his court hearing. Then Michael and his wife (not surprisingly) filed for divorce. A man who molests his own daughter, puts his adopted kids in cages and shoves their faces in toilets as punishment, and then beats his wife is a “hero” to an HSLDA attorney? With heroes like this, who needs villains? Somerville made a massive error in judgment in calling this man a hero. If HSLDA does not condone child abuse, they should 100% condemn what Somerville said, and as directly as possible. At the very least. However, HSLDA said, “Any statements we may have made could be misunderstood to suggest that we condone the abusive actions of some we repudiate them wholeheartedly and unequivocally.” This does not cut it. Perhaps Scott Somerville misspoke or truly did not realize what he was dealing with, but HSLDA is now trying to pass Somerville’s mistake off as a statement that “could be misunderstood.” At the very least HSLDA should have said “Scott Somerville was wrong to call Michael Gravelle a hero” rather than saying that such a comment had instead been “misunderstood.” If HSLDA cares about the well-being of homeschooled children, they should issue a statement saying what homeschoolers should do when they suspect abuse within the homeschooling community. Here’s the thing with abuse, people: it’s disgusting, it’s sickening, and we need to stand up to it. Abuse happens everywhere. As homeschooling advocates are so eager to point out, abuse happens in public and private schools. Absolutely! It happens in Christian homes and non-Christian homes, nuclear families and nontraditional ones. It happens in homes of every religion and race and — for all I know — hobby type. We help no one when we just point our fingers at the “others” and not take a good, hard look at ourselves in the mirror. Abuse happens everywhere. Which means it happens in homeschooling families. It is time to stop whitewashing this fact. It is time that we in the homeschooling community join together and fight abuse in our own communities. It has now been over 12 hours since a number of us former homeschoolers have issued this challenge to HSLDA. 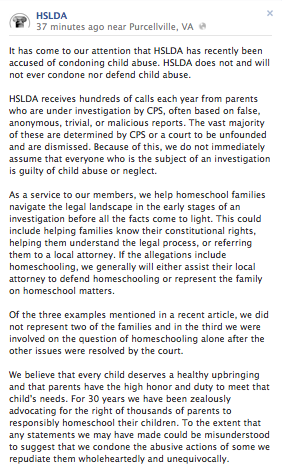 HSLDA has not responded and made no effort to unilaterally condemn Somerville’s calling a child abuser a “hero” or commit to taking concrete steps to address child abuse in homeschooling. It is time to stand together — within and without the homeschooling community — and demand that HSLDA, the public face of American homeschooling, launches a public awareness campaign to fight abuse within our communities. 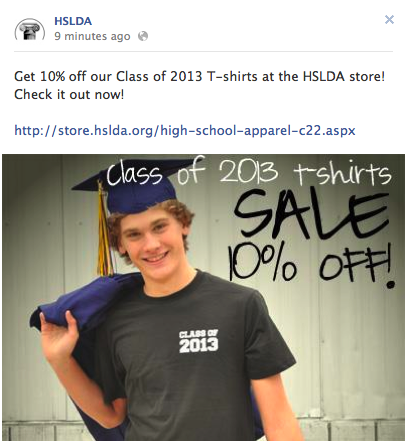 Make your voice known on HSLDA’s Facebook page. Tweet HSLDA at @HSLDA with the tag #HSLDAMustAct. Whatever you believe about homeschooling, whether you are pro-regulation or anti-regulation, this is your moment. If you believe in self-policing, this is your time to prove it. If you believe in activism and making homeschooling better for the next generation, here is your spotlight. We are going live with #HSLDAMustAct. Together, we can make homeschooling better. While I was never home schooled, several of my childhood friends were and are paying the very high price for the decisions their parents made to this day. Thank you for being a voice to all those who are still suffering under the effects of that type of upbringing. I am another former abused homeschooled child, and I couldn’t agree more with this! I grew up afraid of the CAS (Canadian version of CPS) because of the literature that HSLDA sent to our house. My parents were abusers! I was afraid to contact the only people who could help! I was not the only homeschooler I knew who was abused. When you give parents unchecked, unbalanced control over the lives & bodies of their children, OF COURSE bad things will happen! Absolute power corrupts absolutely. Thank you for taking this stand. Shame on you, HSLDA. #HSLDAMustAct. If y’all want to participate in this, that would be awesome. It’s sure an issue that means a lot to me. Send a tweet, sign a petition, leave a Facebook message! CORPORAL PUNISHMENT: IS IT A NO-NO? Home School Legal Defense Association Court Report, April/May 1996, page 11. The number of Home School Legal Defense Association member families who are contacted by social workers continues to rise. Contacts are based upon either anonymous or identified individual complaints alleging that the families are abusing and/or neglecting their children. One constant theme throughout the complaints is that the type of discipline the parents administer to the children is abusive (i.e. spanking). Many people do not believe any child should disciplined with corporal punishment. But despite the fact that most social workers regularly tell parents they do not have a right to spank their children, or that they can only spank their children with their hand, this is not the law in California. The law provides that reasonable, age-appropriate spanking cannot of itself be considered abuse or neglect of a child. There is nothing in the California statutes that prohibits a parent from using an object, other than the hand, to administer the corporal punishment. It must be clearly stated, however, that any abuse to a child which occurs during administration of corporal punishment will be presumed child abuse by the child protection industry. The burden will be on the parents to demonstrate otherwise. 1. Do not spank your children or anyone else’s children in public or outside the confines of your home. The windows and doors of your home should be secured when administering corporal discipline. Spanking should be done in private. 2. Avoid spanking someone else’s child unless you have clear written authority to do so. 3. Do not administer corporal discipline when angry. A spanking is most effectively administered immediately after the children’s offense. 4. Use corporal discipline only for clearly understood and intentional disobedience. 5. Clearly explain to the child why corporal discipline is being administered. 6. After the discipline, always affectionately express your love for your child. A verbal review of the offense and verbal reassurance of the parent’s unconditional love for the child should conveyed. 7. Spanking should always be administered with regard for the child’s age and development.